Looking for deals in Galway? Located just 5 minutes’ drive from Galway’s busy city center, The Huntsman Inn offers free Wi-Fi and free private parking. The staff team are excellent and the services are fantastic. Overlooking Eyre Square in the heart of Galway, The Skeffington Arms offers bright, modern rooms, a vibrant bar and restaurant, and Galway‘s largest cocktail bar. This was the best value I’ve experience in Ireland. The room is large and airy with beautiful wooden floors. Spotlessly clean, very friendly and accommodating staff, and located perfectly. Flannery’s Hotel features spacious rooms with free Wi-Fi, The Galwegian Restaurant and Frankie’s Bar & Bistro. There is free parking on site, and central Galway is 2.2 mi away. It was so nice. Beautifully decorated and the people are so friendly! 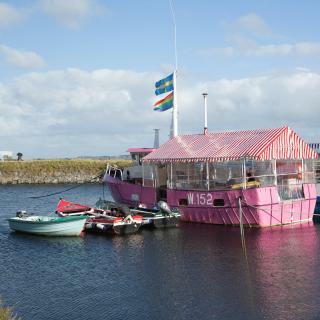 The award-winning, 4-star Galway Bay Hotel overlooks Galway Bay and is located on Galway’s Blue Flag beach. Beautiful spacious country style setting..... Great welcoming staff at reception & the the bar. Overlooking Eyre Square, the elegant Hotel Meyrick features the No. 15 On The Square restaurant and free recreational facilities. Top notch hotel with every need met. Located in its own private grounds, this 4-star hotel offers spacious, elegant rooms. It is only 15 minutes’ walk from Galway’s center and 5 minutes' walk from the nearest shopping center. Lovely restaurant on site. Room beautifully renovated. Onsite free parking such a bonus. 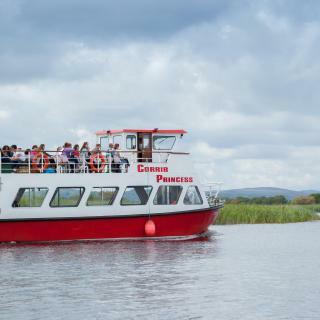 The Connacht Hotel is located close to Lough Atalia, 1.5 miles from the city center. It features a leisure center with a 20-yard pool, spacious rooms, free Wi-Fi, and free parking. Food at the Hotel was great especially the breakfasts. Nightlife in bar was entertaining. Less than a 15-minute walk away from Galway city center, the modern 4-star Maldron Hotel Sandy Road Galway is located at Headford Point. Excellent stay , it’s our third year staying at the maldron for Galway races! At Eyre Square, the warm and comfortable Imperial Hotel in central Galway is close to Galway University NUIG and the bus and train station. This hotel is right bang in the city centre, only a minute walk from the train and bus station. This contemporary hotel with leisure facilities, free parking and free internet access is opposite the racecourse, close to Galway city. Room was great, exactly what was advertised. Rockbarton Park Hotel offers accommodations in Galway. Guests can enjoy the on-site restaurant. Each room includes a TV. For your comfort, you will find free toiletries and a hair dryer. Patsy and Terry were terrific hosts! I would highly recommend! The Residence Hotel is located in Galway's entertainment neighborhood and offers free WiFi. Breakfast was a little weird and dull...it was served in the bar next to the hotel. In Galway’s historic Latin Quarter, The House is an elegant, 4-star hotel just off Quay Square and the Spanish Arch. It offers air-conditioned rooms, free Wi-Fi, a restaurant and cocktail bar. The aesthetics were gorgeous, the staff extremely friendly and they're choice of gin! Which hotels in Galway offer an especially good breakfast? For hotels in Galway that serve highly-rated breakfasts, try The Huntsman Inn, Park House Hotel, and Menlo Park Hotel. Which hotels in Galway have nice views? Jurys Inn Galway, Glenlo Abbey Hotel, and The Galmont Hotel & Spa got great room view-related reviews from travelers in Galway. Which hotels in Galway are good for families? 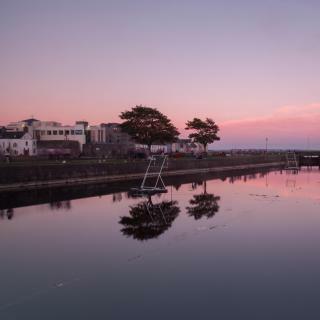 Many families visiting Galway loved staying at Salthill Hotel, The Huntsman Inn, and Park House Hotel. How much is a hotel in Galway for this weekend? The average price per night for a 3-star hotel in Galway this weekend is $253 or, for a 4-star hotel, $390. Looking for something even fancier? 5-star hotels in Galway for this weekend cost around $534 per night, on average (based on Booking.com prices). How much does it cost to stay in a hotel in Galway? On average, 3-star hotels in Galway cost $120 per night, and 4-star hotels in Galway are $153 per night. If you're looking for something really special, a 5-star hotel in Galway can be found for $233 per night, on average (based on Booking.com prices). Which hotels in Galway are good for couples? These hotels in Galway are highly rated by couples: Park House Hotel, Glenlo Abbey Hotel, and Forster Court Hotel. Which hotels are the best ones to stay at in Galway? 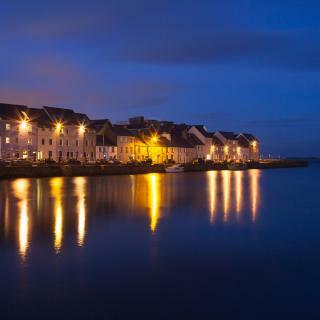 Forster Court Hotel, Park House Hotel, and Glenlo Abbey Hotel are some of the popular hotels in Galway. What are the best hotels in Galway near Galway Clinic Private Hospital? Some of the best hotels in Galway near Galway Clinic Private Hospital include Sea Mist B&B, Clayton Hotel Galway and The Branches B&B. How much is a hotel in Galway for tonight? On average, it costs $89 per night to book a 3-star hotel in Galway for tonight. You'll pay around $111 if you choose to stay in a 4-star hotel tonight, while a 5-star hotel in Galway will cost around $198, on average (based on Booking.com prices). 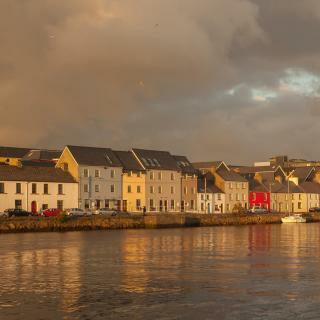 Welcoming Galway is a small city with fantastic nightlife and an infectious atmosphere. Outside of the Galway Arts Festival, there’s still plenty of live music in the Irish pubs to get the party started. The Galway Races at Ballybrit Race Course west of Galway Airport attract a good crowd, as does Eyre Square, a green space with flags of previous ruling families who gave it its nickname - City of Tribes. To the south are cobbled streets housing brightly colored shops and restaurants. 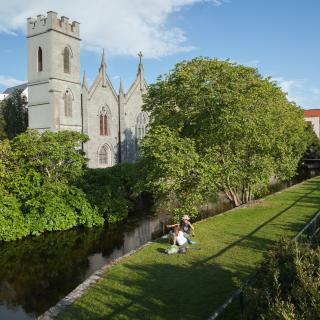 Sights in Galway include its cathedral and city museum which has an interesting insight into the history of the city and Ireland. 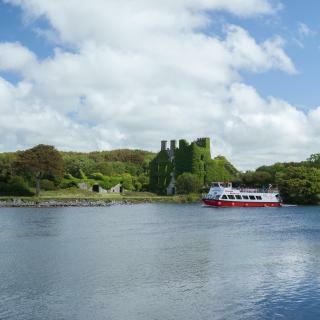 Lynch’s Castle is the last remaining 17th-century merchant house, and the Spanish Arch is a small section of city walls by the Corrib River, linking Galway Bay to huge Loch Corrib. Where river and ocean meet is Claddagh Park, a great spot for a picnic with a view. Further around the coast is Salthill Promenade, home to Atlantaquaria, Ireland’s national aquarium, focussing on sealife off Irish shores. It’s a Christmas Day tradition to jump from Blackrock Diving Tower nearby into the icy Atlantic Ocean, though you may well spot some wag giving it a go. Booking.com has an excellent range of Galway hotels, apartments and B&Bs to complete your stay. Walking around the centre of Galway (particularly when the stay is short) and listening to the great entertainment provided by the street entertainers. We ate in a lovely new bistro called Papa'z Bistro. The food was excellent. They were having a few teething problems but in time these should be ironed out successfully. I liked all the fun shops and food establishments in Galway City Centre. It is also close to the Aran Islands so I took a ferry over to the islands for a day! I went to Inis Mor(the bigger island). I had the best fish and chips there from Ti Joe Wattys Bar! The walk around the island is a photographers paradise! Plus you can bike around the island too! Well worth the trip! Super unique! Galway was awesome in my book! 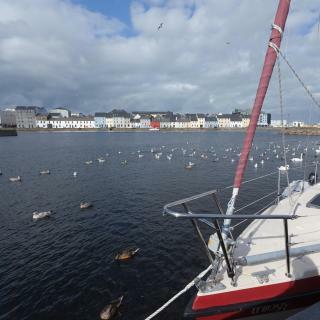 We liked Galway as a place to stay on the way to the Aran Islands. The city itself is easily navigable and the walk to Salt Hill was great—round trip about 12 miles. We enjoyed the monument to people who sailed and died on famine ships, and the views and the air lifted our spirits. We heard that sessions were supposed to be great in Galway, but we should have been more organized to find the times and locations. As it was, pub sessions we stumbled on were crowded and there was not a seat to be had. Could be that our timing in April meant Galway was saturated with school groups. 2 days is not long enough to really enjoy this area! 2 days is not long enough to really enjoy this area! The walk along the river to the cathedral is lovely with swans and quaint homes along your way. The pedestrian walk is fantastic with restaurants, churches, shops, pubs...so much to see and do. Don't miss out on Mc Donughs fish and chips...wow,,,,easily the best ever! The free museum is wonderful on history and appreciation of the war and outcomes for the Irish people. We stayed at Kinlay House (Britta at reception is fantastic!) and the location near the bus is easily accessed. Poucan restaurant for oysters and great music! I really liked to stay there. I really liked to stay there. Has a niece view, and it’s really close for the center.. I went to celebrate my birthday and was lovely.. the apartment is all equipped with everything we needed to cook, I recomend for everybody.. Loved our stay in Galway! Loved our stay in Galway! Of the cities we visited in Ireland, Galway is far and away my favorite. You are only a short drive to some of the most beautiful scenic sights in the country. We were only in Galway for two days -- wish we could have stayed longer to spend more time exploring the city! Great location.Only 5 minute drive into city.Delicious Food available in bar. Fabulous hotel with fantastic leisure centre,thermal suite and swimming pool. Lovely views out across Salthill with lovely walks along the prom just a step outside the doors of the hotel.Definitely the best of both worlds with the scenic relaxed location of the hotel beside the sea and the city buzz only a few mins away.Already looking forward to returning to Galway for another break in May!!! The room was beautiful and the innkeepers are some of the best people I have met in Ireland. Breakfast was delicious and this B&B is beautifully decorated and located by the sea, great views and easy access to Galway center for food and entertainment. I would recommend a stay here for anyone looking to visit Galway! Room is modern, spacious enough and clean. Lots of easy parking spaces. Great value for money and a short drive from the city centre of Galway. All the service staff here don't smile , quite different from all the other hotel staff we have encountered in Ireland. Lovely property short walk to Salthill and the city center. Lovely breakfast and very friendly helpful staff. Use of the kitchen to make tea or coffee at any time will definitely be back. Staff was very friendly. Hotel lobby is very nice and gives a really good first impression. Room was clean. Bus stop to city center is close. Cocktails in the bar are pretty good. Everything was perfect, quite accommodation, nice facilities and a big variety of dinner and breakfast. The hotel is close to the city center, especially if you use the 409 bus! Really a good hotel, totally clean and the staff are pleasing and very helpful. One of the best hotel we stayed in Ireland. Rooms are spacious and well arranged. Easily accessible to the City Centre. Great breakfast. Bridey was a wonderful host. Very clean rooms. Loved the culture in Galway. It was really close to the city centre. It had lovely common areas. The staff was really helpful. Good quiet location, 5 minutes from city centre. Adjoining hotel great for evening meals. Cool hotel in a good location a bit outside the city centre. The location perfect and very near from train and bus station,,, nice room and the staff very lovely.